USA Today: Police in the Black Sea port of Odessa said late Friday that 31 people died when a union hall was set ablaze as pro-Russia demonstrators battled in the streets with Ukrainian loyalists. More than 30 people were reported to have been killed in violent and chaotic clashes in the southern Ukrainian city of Odessa on Friday as pro-Ukrainian activists stormed a building defended by protesters opposed to the current government in Kiev and in favour of closer ties with Russia. 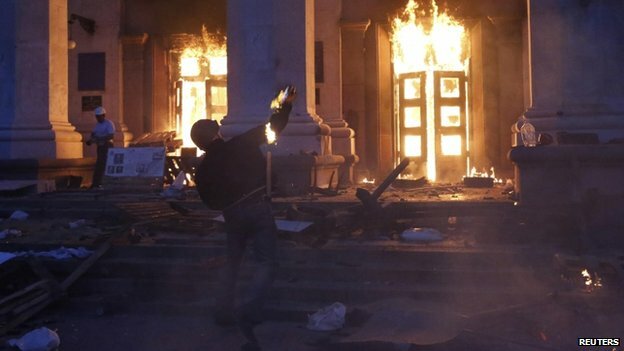 Odessa’s large Soviet-era trade union building was set alight as pro-Ukrainian activists mounted an assault as dusk fell. Police said at least 31 people choked to death on smoke or were killed when jumping out of windows after the trade union building was set on fire. Just a reminder, but these folks are U.S. allies in the struggle to impose IMF austerity and NATO on Ukraine. Once again we’re siding with the worst people we can find in a country: neo-Nazi thugs to carry out ‘pro-U.S.’ violence, and abject puppets to do what we say in Kiev. P.S. Another place to find fairly unbiased reporting on this tragedy is RT.com. P.S.2 The new column by Pepe Escobar is perfectly timed: ‘Sooner or later Kiev’s army, Right Sector will attack civilians’. CNN:It is unclear how the fire began, but it comes amid ongoing clashes between pro-Kiev and pro-Russian protesters. UPDATED at 4:12 a.m. ET to ’39 Die’ based on this RT source. Pentagon PR Hit Man At The Small Business Administration?